Without going into too many details of my younger years, I can let you know that I had incurred about $50,000 in consumer debt during 1998 – 2000. With little to show for it, I was putting a large chunk of my earnings as a then single mom into minimum payments. All of it was going to interest. Here is how I dug my way out of debt – and how I remain in control of my finances today. Poor choices during my late teens left me a single mom with over $50,000 in credit card debt and a large personal loan to a friend. My salary was modest, but my expenses were looming. I had nothing to sell, as the debt had been incurred during a relationship that left me with a couple pieces of crappy furniture and many receipts for golf, dinners, and who knows what else. Needless to say, I was now on the hook for someone else’s purchases, as all of the lines of credit were solely in my name. While I legally could have looked a debt settlement or bankruptcy, I didn’t feel good about either option. I may not have swiped the card myself, but I enabled someone else to do so in my name. I owed money, and everything I knew in my gut said that I needed to pay it back. I looked into several possibilities, and it was only after I met my wonderful husband, that I was introduced to the world of credit counseling and debt consolidation. He had signed up with a reputable company that was helping him to get back on his feet after a bad business deal, so I followed suit. From that point on, it was really a matter of sticking to the plan. My cards were closed by ME, not the card company, leaving my credit history with good marks. (Despite my debt and difficulty in paying the cards, I always paid at least the minimum and didn’t have any late payments.) I paid one monthly sum to the consolidation company, and they dispersed it to the credit companies. In return for my guarantee to keep paying, my rates were lowered considerably (0% in one instance.) I was actually seeing progress in my war on debt! Paying over 1/5 of my income to debt was painful at first, especially since I had to deal with the hurt and anger that surrounded the previous bad relationship and how hard my new husband had to work to help me make the payments. It was through this arrangement, however, that I realized just how solid my marriage was, and we vowed to always approach our financial obligations with the same sense of responsibility as we did this debt from the past. In just four short years, we had paid it all off. The personal loan from a friend was paid off three years after that. The moral to this story is fairly straightforward. It is possible (and wise) to pay back enormous amounts of loaned money – even if you did not benefit in any way from the debt. Today’s society seems to have all kinds of quick fixes to address the consumer debt problem, and we rarely hear about those that quietly trudge on in their repayment… month after month… year after year. My spending habits have remained modest, even though we no longer that that large monthly payment to accommodate. (Of course, we now have 5 kids, a house, and some cows – you do the math!) I do use credit cards, pay them every month, and use them as a tool for advancing my financial goals – not a safety net for catching poor decisions. 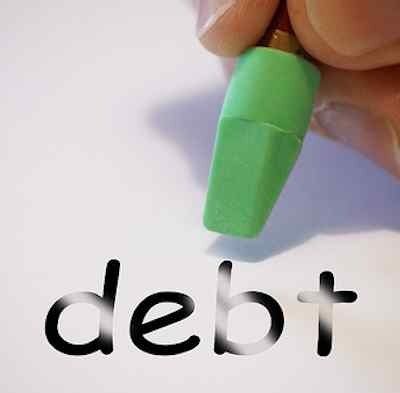 Do you have a story of debt repayment that you would like to share? We hope you can use this as an opportunity to inspire and encourage others! Kudos on having a plan and sticking to it! It’s easy to set financial goals but sometimes we set goals that are too painful to stick to and we fall short of sticking to the plan. As this wise consumer states, there ARE ways to get help for your debt, all you have to do is ask for it. Thanks for the supportive comment! Asking was admittedly the hardest part of paying back the debt… it’s hard to fess up to mistakes! Yikes, 1/5 of your income was going to pay off debt! That’s a pretty impressive feat…to pay that much off every month… nice work. I don’t think I’ve ever been up that high but I can see how things could have easily played out differently in the past for me, to get to about that amount. I had a few random debts, not all in one place, and nothing felt better than being able to finish one debt off and move onto the next one until they were all gone. I’m sure you know the feeling after your ordeal! Always happy to see people making it out of their debt. Most people that I talk to are usually at a later stage with their debt and they only have a few options left such as debt consolidation or bankruptcy. However, neither option is preferred given the long processes involved and the lasting effects. I wish I had the opportunity to advice people ahead of time to follow some of the strategies you mentioned in this post so they can learn to curb their debt before it’s too late. Good article. Thanks for the inspiring story. I feel your pain because I am there right now. My twenties were a disaster and my thirties were even worse. I got married for all of the wrong reasons, found myself alone at 35, while all of my friends were having their 3rd child. Felt like a failure. The only thing that kept me going was shopping. And boy, did I shop. All of the time. At 44, I was 55 thousand dollars in debt. Realizing that I could never retire, I decided to start paying off my debt. I have been living on a bare bones budget. I only owe 5000 now. It will be paid off in May. I can’t wait. It has been a huge monkey on my back for many, many years. Not to mention….shameful. Almost like I was hiding a drug problem. The past two and half years have been very hard. Can’t buy anything, can’t go anywhere, and anytime someone would ask me to go anywhere or do anything it has been really hard. Also, buying birthday presents and chipping in for gifts for babies for office mates about puts me over the edge. But I am almost there.